SAGE 2YC > Increase Career Preparation > What do Geoscientists Do? Jump Down To: Career Descriptions | What degree is needed for different types of careers? This video provides an overview of several Earth Science career fields within the U.S. Geological Survey. The program features several interviews with USGS employees in which they relate how they became interested in their chosen Earth Science field and how they apply their education and background to their work at the USGS. Many professional organizations provide information about geoscience careers and the geoscience workforce. Below are a few examples of videos and other resources that describe geoscience careers, including technological careers that require an associates degree. You can find a more extensive list of resources across the geosciences on the Professional Society Career Resources page. The Advanced Technological Education Television (ATETV) site includes short videos on a variety of programs and careers including energy technology, environmental engineering, environmental technology, geographic information sciences, geospatial technology, green technology, water treatment technology, and wind technology. The Marine Advanced Technology Education (MATE) Center provides information about the knowledge and skills needed for various technical marine occupations including oceanographic instrumentation technicians, hydrographic survey technicians, and marine technicians who work aboard research vessels. The Workforce Program of the American Geosciences Institute include a careers brochure, career videos, career FAQs, profiles of geoscientists, a guide to geoscience careers and employers, and more. The Association of Environmental and Engineering Geologists has resources for undergraduate students including details about the profession of engineering geology, environmental geology, and hydrogeology, as well as case histories. 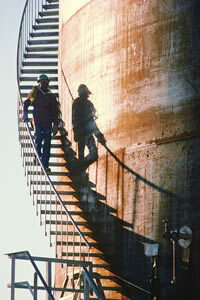 OceanCareers.com includes career profiles, employer profiles, interviews with interesting people, and more. Another way to explore careers in the geosciences is use the Department of Labor My Next Move website. These profile pages from Building Strong Geoscience Departments were created by interviewing employers in a variety of geoscience professions and employees with degrees in geoscience. They can be a valuable source of information for those looking for a career in the geosciences. If you don't personally know someone working in the geosciences, it can be difficult to imagine yourself as a geoscientist. This collection of career profiles combines personal descriptions of the individual career paths of many geoscience professionals. What degree is needed for different types of careers? 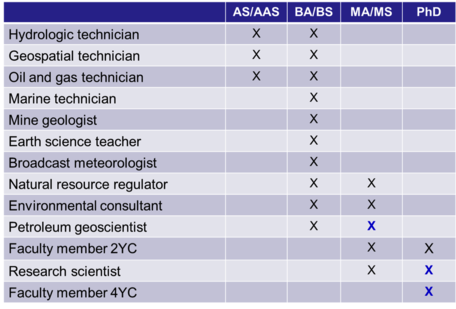 Examples of the degree(s) necessary to qualify for certain kinds of jobs in the geosciences. There are many pathways into the geoscience workforce, ranging from those that require an associates degree to that that require a PhD and post-doctoral experience. The chart below illustrates some of the workforce possibilities for those with different degrees. Of course, the specific requirements for a position might be different for different employers, in different locations, and for geoscientists with different levels of experience. Check out the Geoscience Degrees and Careers page for more information on what kinds of jobs are typically available at particular levels of qualification.